No art experience is necessary! All ages welcome! This hands-on art making project will celebrate and honor the diversity in the Napa Valley. Joining with Compassionate Napa Valley and the Napa Valley Center for Spiritual Living, Carol and her team of artists will guide participants in making a Napa Valley "Soul Mandala." Each person will make a small circle expressing their hope for a peaceful, unified valley community. 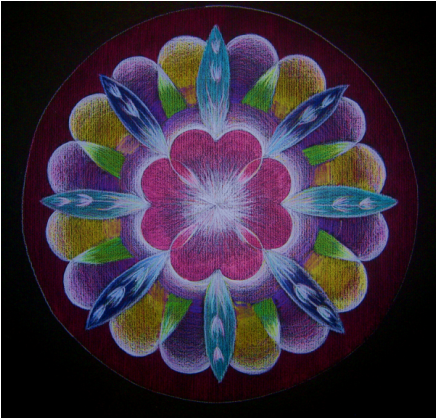 The smaller individual circles will be incorporated into the larger Mandala Art Circle. Participants will leave knowing they are helping to create a visual message of peace, love, and wholeness for our community. Mandala is a Sanskrit word for circle. Circles represent wholeness and unity, and can serve as a reflection of the inner light of the soul. They have been used for healing in ancient cultures for centuries. Working, walking, sitting, painting, or drawing in a circle creates a sense of wholeness, unity, and inner peace--within the art makers and for the people who view them. Carol's intention in creating Art Circles for Peace is to facilitate more acceptance and understanding of differences, bringing about more peace and unity to the rich diversity in our valley community. She hopes this will create a ripple effect out into the larger world when the mandala is reproduced and viewed by many. April is ARTS month in the Napa Valley. Exciting events are scheduled in many creative venues all up and down the valley. www.artcouncilnapavalley.org for listing of more events. "All the religions of the world, while they may differ, unitedly proclaim that nothing lives in this world but Truth." Go to my Mandalas page to learn about mandalas and see more of my mandalas.